GUANTANAMO BAY NAVAL BASE—Prison guards here at the Guantanamo Bay prison are attacked on a “daily basis” by detainees, according to Commander John Filostat, a prison spokesman for the Joint Task Force (JTF) Guantanamo. Detainees also engage in “splashing,” which is when a “bodily fluid cocktail” is tossed at guards, who now wear protective wear and facemasks when dealing with high value prisoners being held at Camp 5 and Camp 6, according to Filostat. 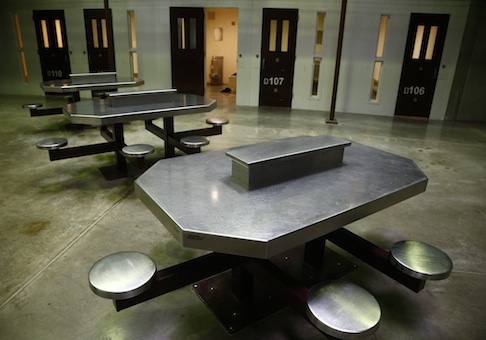 “There’s some type of resistance every day,” Filostat said, noting that a “small number” of detainees are still being force fed due to hunger strikes. “We will always have those trying protest,” Filostat said. One guard and his family were physically threatened by a detainee who had obtained a copy of a media report that featured the guard’s name and photograph, Filostat said. “Personal information” about the guard was used “against him as a threat by a detainee” who had read the report, he said.